I re-read this Alfred North Whiteheadquotation to my students in the last weeks as we read through Adventures of Ideas. We were taking a welcome break from the philosophically demanding Process and Reality. I explained that this is one of Whitehead’s more frequently cited sentences because he succinctly and poetically describes his position that life entails loss, and you can’t go back and get what you lose. In moments like these, I curse the fact that even my closest friends think that I have some special kind of knowledge as a minister and professional theologian. I took a deep breath because that phrase usually precedes some difficult, heart-wrenching question that has no satisfying answer. But we get second chances. And third and fourth ones. God never stops calling us. As we move forward, there are new opportunities. It’s not the same, but we get more chances – often in ways we don’t expect. I know it didn’t make her feel any better. I paused. After miscarrying, I’ve come to understand the answer I’ve often heard others say: “I just want a healthy baby.” But I didn’t say that. Perhaps it was the length of our acquaintance, the comfort of the kitchen or the recent evocation of Whitehead that made me tell her the truth. It’s been five months since my partner and I saw the bleep on the ultrasound. In the four months after that, I saw my OB/GYN, hematologist, nurses and anesthesiologist more times than I’d ever wanted to. While I have an intellectual level of gratitude for trustworthy practitioners, good health coverage and supportive friends, none of it actually gets me what I want. I want the twins the doctor mentioned under his breath from the space between my legs. I want the babies that my partner kept kissing in a place a little higher on my stomach than where they really were, kissing from the moment we realized my period was late. I want the babies about whom I called my mother – even before the official test came back. I want the growing belly, nausea, maternity clothes and upcoming parental leave. I deeply believe what I told my friend about second chances, but right now, that means nothing. Grief renders hope philosophical. Grief smothers my ability to think, reason and plan. Since my honest moment in the kitchen, grief has robbed my life of a measure of joy. Life broke into the house of my body and soul and took something that cannot be recovered. There’s no one to blame. It just happens sometimes. And I’ll cry about it … I guess, until I don’t. This article is cross-posted on Beautiful Mind Blog. 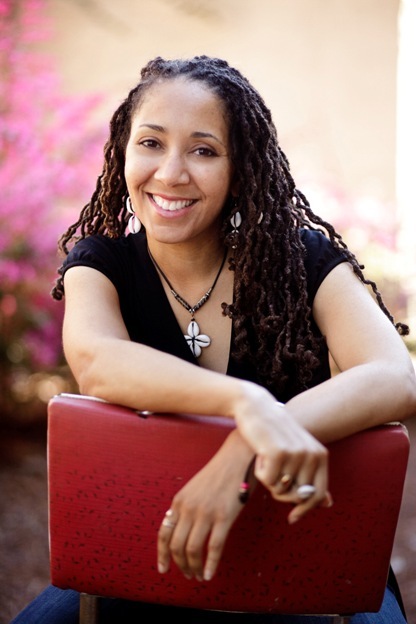 Monica A. Coleman is Associate Professor of Constructive Theology and African American Religions and Co-Director for Process Studies at Claremont School of Theology and Claremont Lincoln University. An ordained elder in the African Methodist Episcopal Church, Coleman has earned degrees at Harvard University, Vanderbilt University and Claremont Graduate University. She blogs about faith and depression at Beautiful Mind Blog. I spent a long time grieving and being angry for what I had lost (in my case men I thought loved me back) and being angry and wondering “why me” when other women seem to have found their true loves–why couldn’t I? After a long time in the underworld, I finally realized that I was denying what I did have–friends, family, a cat, a home, a fairly good life, all things considered. I know this doesn’t help when you are in the throes of it, nothing helped me then, but it is the wisdom I have gained in my life. Since then, overall, I have been more grateful for “Gaia’s gifts” — life and love — in whatever form they come, than I have been grieved, hurt, or angry, that I don’t have what (actually only some) other people have and what I used to think I had “every right” to have. I guess what I have learned in part, is that life is not about me. Take care dear sister in your grief and anger and healing. Just after I posted above, I thought about the difference between saying life is robbery and saying life is a gift. In one case, something that was “yours” is taken from you, and in the other, you are grateful for what you have been given. Both are ways of saying that the “ego” with its desires is not everything, it will not “keep what it has,” and it does not “deserve what is given.” (I do speak of gift in a Lutheran way, we are neither deserving nor undeserving of Gaia’s gifts.) I think Whitehead was saying that we cannot expect to have everything we want and that even when we do it will be taken in time. Was he thinking about the loss of his son? Still I am struck by a more pessimistic and optimistic way of saying the same thing. Despite what may have been Whitehead’s irony, the word robbery suggests that something we had really was “ours” until it was stolen. In contrast the notion that life is a gift engenders gratitude for what we do have for as long as we have it. This is why my prayer is “As we bless the Source of Life, so we are blessed.” And not: “rage rage rage against the dying of the light.” I still fight against injustice when it is caused by and can be cured by human beings. I am, perhaps, naieve, but “life is loss” is–to me–an incomplete statement. Life is indeed filled with the loss of everything we perceive as precious. However, at the same time, the losses we endure increase our capacity to appreciate and treasure what arrives after loss as well as increasing our appreciation for that which was lost. My mother lost her vision and it seems to be slowly returning–at least in part. Last night she wrote to me in joy that she had seen “two stars.” Two stars–after a lifetime of seeing fields of stars in heavens cluttered with them. Two stars–and she was ecstatic about their beauty. this is beautiful and tender and makes me want to read whitehead, even though I think it will hurt. I am feel loss too. After reading this, I was amazed at how I was able to feel the emotion through your writing. I too understand what it is like to hold on to grief, and anger. It got to a point where my smile was not able to cover up what was hurting within. Eventually, I realized my original coping methods were sending me in the exact place I was trying to escape. God was my turning point in helping me rebuild, what I thought was a crumbling foundation. The reassured love that God delivers me is what has blessed. Peace and Blessings. Your writing really touched me deeply, maybe because like you and everyone else, I have experienced some type of loss, and a loss similar to yours in particular. What struck me in the beginning of your piece is the strength and hope that was shared through the communication between you and your friend. It has been my experience that the most incredible insights I have gained are through talking with others, whether it was in sharing sadness and tragedy, hope and love, or an overcoming of obstacles. The wisdom and strength that has carried me through hard times has not come from texts or academics, but through shared daily experience of other women and as well as men. Time spent on rebuilding or regaining the past has always turned out to be wasted time for me, and while learning from the past is important, it is watching others walk through loss and tragedy and getting to walk along side them that provides the most hope for me, as well as proof of our connection to one another. I was told that there is no way around sadness and pain; the only way to get past it was to simply walk through it. It is the “walking through” that propels us forward, maybe to that “second chance” you spoke of. “Life is robbery.” This quote spoke to my soul because it is so true and it even holds weight if placed in different contexts. For example, people get robbed of resources, opportunities, human rights, etc on a daily basis and the robbery of life seems to happen more in underserved communities, but I digress. People often spend the present dwelling in the past, which is not a healthy way to live, at all!! It is important to acknowledge your past, but it is equally important for you not to consume yourself in the irreversible (that’s a sure way to lose a couple of marbles). A lot of people say that everything happens for a reason, do you believe that? I do, but only to a certain extent. Whether we like it or not, there IS a greater plan for each and every one of us and we have absolutely no control over. Realizing and whole heartedly accepting that as true is what people often have issues with, including myself. Maybe that is the key to the robbery of life: accepting the fact that we will all be robbed one way or the other and the police will be nowhere in sight. I know its been about a month since you wrote this, but I feel as if something is telling me to respond. So here it is, I have been blessed with three children, I tell you this because I want you to know I understand the sprite of birthing, and loss and will not speck without guided knowledge. that one can reclaim some of the loss, or at least venture out once again perhaps with a different song or a different fulfillment then one had planned. I will give you just a brief gimps, It has for reasons not my own, taken me 32 years to get the chance to finally get to college to grasp a degree of my own. I am in the mist of this completion right now. I am in essence recapturing that which was taken from me, I was robbed. I know that my journey will never be what I thought it would or should have been had I gone to college when I though I was ready, the stars had other ideas. I wish for you a road that will allow you to obtain that which your heart desires, I only ask that you allow your heart to embrace the possibilities of a beautiful alternative should the universe offer.